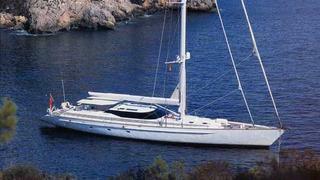 Simon Goldsworthy at Camper & Nicholsons tells me he's sold the 35.1m sailing yacht Aime Sea. Formerly known as Corinthian, Aime Sea was designed by Dubois Naval Architects and built by Alloy Yachts in 1994. She combines good sailing performance with a very adaptable and practical layout. Aime Sea has benefited from an extensive refit and all her systems are maintained to the highest standards. Her interior by Redman Whiteley Dixon is flooded with natural light and finished in ‘tiger-maple’ with pale leather deck heads. Aime Sea was asking €3.25 million.